"As soon as we get the green light we'll drop everything"
The Nintendo Switch Nindies Showcase was rather impressive prior to the system's launch, demonstrating some exciting download titles on the way to the console. A follow-up infographic showed a broad range of confirmed titles set for a 2017 release on the Switch eShop. Of course, while a number of games are coming and plenty of developers are on board and happy to be so, not all have found open arms for their projects. Perhaps a surprising omission, to date, has been Tom Happ's Axiom Verge, a title that's been critically acclaimed and made its mark on the Wii U eShop last year; we loved it and awarded it a 10/10. Happ's publishing and business partner, Dan Adelman, has confirmed to us that they want to bring the game to Nintendo Switch but have so far not received approval. Many fans have asked us to bring Axiom Verge to the Switch. I have reached out to my old co-workers at Nintendo of America many times, but so far we haven't been approved for the platform yet. As soon as we get the green light, we'll drop everything and get right to work on the Switch version. It'll be interesting to see if this changes in the near future. If there's sufficient fan demand, for example, perhaps progress could be made in bringing the title to Switch; as those behind the game make clear, they're eager to make it happen. 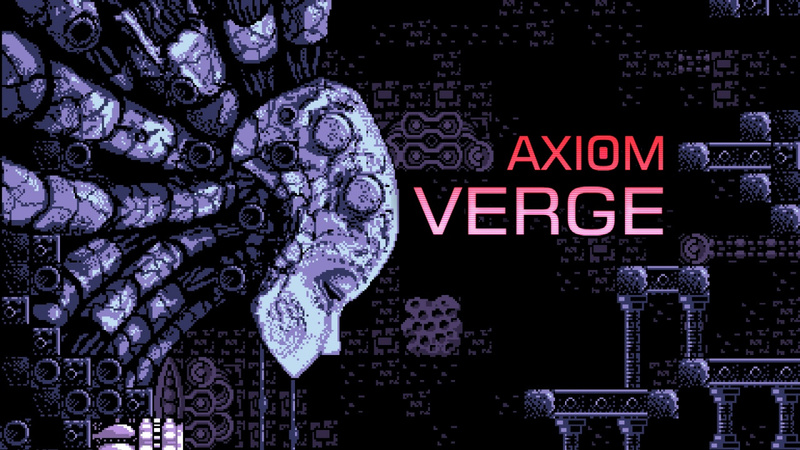 Would you like to see Axiom Verge on the Nintendo Switch? aw come on folks i dont wanna have to say "first!" I would buy this day one! I haven't picked this up yet but I'd buy it on the switch. Great game. I don't have a Vita, so I'd love to have another way to play it on a handheld (I always assumed it was going to come to 3DS, but it appears I was mistaken). It is so fun and captures the magic of Metroid in a way that Nintendo hasn't even put the effort into trying. Not being familiar with Nintendo, is there a reason they would want to delay this game coming out? You have a decent game who's developers seem to want to release on your system. What could be the problem? @Rumncoke25 They are being very selective with indies. Is Nintendo still trying to piss off Metroid lovers? Seriously?? What the heck, man!? Been holding back in getting this on the Wii U. Looks like I'll be playing this on the go on the switch. "They are being very selective with indies." I read the news Nintendo is "selective" on Switch, but this is a quality game, and look at that mobile-like farming game that released same day as Switch, that does not look like a great game. Well here they are. What are you waiting for!? Maybe the game would clash with an upcoming game they will announce at E3? I think "selective" was more about the tight process to approve a game more than the quality of the game. So it would rule out low quality games, but would also slow down approval of obvious games like this too. I'm guessing there are more checks or higher-up departments that look at it before approval than before which creates a bottle-neck. Don't worry sir, it will happen. I would rebuy it in a heartbeat. Unpopular opinion, but that game was the most disappointing one I played in recent memory. Good idea, but way overhyped. Maybe they don't want Switch being typecast as a place chock full of pixel art platformers and not much else? Alternatively, will Axion Verge help shift Switches? Probably not, as most of the audience whom it appeals to are either core Nintendo fans who will get the Switch anyway, and/or people who've bought the game already on other platforms. It does though seem somewhat harsh considering the great reputation the game has. I want that Wii U physical edition, but I'd prefer the same version to be made for Switch. Is this similar to Metroid? Maybe they won't want to overwhelm people with Metroid. New Metroid confirmed!!! I'm sure this will be approved at some point. Axiom Verge appears to be a quality game, and one I would happily love playing on the Switch. Nintendo are probably trying to iron out a nice timeslot for its release. @GrailUK Never gonna happen. I wouldn't be surprised if Nintendo didn't make any Metroid titles for the Switch. Approve this! I want it on a portable. Torn here... Switch release or the Wii U collectors physical release? Silly question. Of course I'd love to have this on Switch. It's the reason I haven't bought it already. Make it happen Nintendo! Day 1 buy! Gogo tom happ! Wooohooo! Knew he would bring it to switch! I bought Axiom Verge on PS4 and Vita (cross-buy) and really enjoyed playing it on both platforms. However, I sold both my Playstation systems to raise funds for my Switch purchase last week and Happ's Metroidvania masterpiece is certainly one of the games I'm really hoping comes to Switch so I can replace it. Notable others include Crypt of the Necrodancer, Darkest Dungeon, Inside, Nuclear Throne and The Witness. In the meantime, the likes of The Binding of Isaac, Cave Story, Enter the Gungeon and of course, Shovel Knight will help pass the time! For the love of all things gaming, will someone please get Tom Happ a Switch dev kit already! Get on it, Nintendo. . . .
@FragRed Just listened to that NVC episode today, and I immediately thought of Axiom Verge. I've been hyped to buy/play that game, but I've been holding out in hopes it would come to the switch. Fingers crossed. And cramped from playing Zelda. Been waiting to grab this title but can't get the Xbone versions in Aus and don't use my Wii U enough to buy it there (haven't looked to see if its even available there yet). Switch version would be ideal for me and would secure the purchase finally! (I can region swap if needed). @BLP_Software ooooooh, does this mean no more Rcdiamax or whatever it was called? I'd definitely support Axiom Verge and Happ. Been wanting this game on-the-go for a long while. Oh no... is Metroid the new Half-Life 3? Brutal. @Dysnomia Ha! I love that you don't even know how his username is spelled. Goes to show his everlasting impression - or lack of. @Dysnomia Pretty much, but it does also lock out people like myself and Tom Happ who don't have publishing pull and are just small one or two man teams. I'm sure eventually Nintendo will give the green light on a great game like this. They said they'd be more picky this time around but passing on a quality game like this would be silly. Would only compliment the Switch library. Also if they didn't even start work on it I'll assume it'll be a while before release. Great game. Deserves a release everywhere really. I wonder if it's got anything to do with Dan Adelman being involved? We know things didn't end very well there with NoA. Yes, I know the game is available on Wii U, but I'm just saying perhaps they're not on the A-list at the moment for that reason? @ThatNyteDaez Doesn't make sense. They want Nintendo to green light them in order to start working on the Switch version, not to have it on the eShop. Would Nintendo hold up Axiom Verge on Switch because Metroid is coming? I love AV on my WiiU and would love it too on my Switch. At least to tide us over till we do get another 2D Metroid. I'll wait on this version to play it. It is tough to read an article like this and know what is best. On one hand I don't want the Switch eshop to become a polluted cesspool like the 3ds and Wii U eshops, but I don't want games with good reviews getting missed. Hopefully Nintendo has a good plan on finding the right balance. If Voez gets the "ok" then so should Axiom Verge. @RyanSilberman meh, I knew it was close enough to get the point across. @BLP_Software yeah, it seems like the line between trash developers and small developers is pretty well defined. Nintendo just let anyone in last time so it is understandable that they would want to be a little cautious, but as always they are probably overreacting. I wish you the best and that Nintendo finds the right balance. Yes but at the moment I'm excited about the retail version coming to the Wii U. It's mildly nutty how a bunch of indie developers are coming out talking up how easy and cheap it is to develop for Switch and here's Tom Happ going on about how he's apparently the only one who's been left out in the cold. I get where Nintendo is coming from when it says it will more actively curate the indie selection, but honestly this should have been greenlighted and worked into the launch lineup next to FAST RMX and Shovel Knight. May be Adelman, maybe new protocol, but Happ is clearly very talented and deserves access. maybe they don't want to oversaturate the switch with platformers. kindah ard to do since it's bone dry in the eshop. the indies gave luv to nintendo when the bigs left. they better not shun the indies jsut because the bigs are back. Yes! I would double-dip because of the portability! I would absolutely double dip and buy Axiom verge for Switch. The PC version is fantastic and I have a lot of fond memories attached to it. Frankly, I have been looking for an excuse to play it again. It will certainly come out on Switch. Nintendo sent out lots of devkits in the last months and now they'll have their hands full to review every pitch they get. Edit: So I don't think this has anything to do with Metroid. I got four games at launch and would not have the time anyway to play anything else beside Zelda, Fast RMX and Snipperclips. I haven't event tried out 1-2-Switch really. I get that they're not letting everyone in straight away and are trying to maintain a high quality standard, but Frontier Days and Vroom in the Night Sky look pretty poor, so some dross is clearly still getting through. I'm sure these guys will be in soon though and AV will appear shortly afterwards. I would like to see Axiom Verge on Nintendo Switch!